Previously, I’ve written about Quartz, which is the 2D graphics engine that powers the graphics in iOS. In this post, we’ll take a look at various examples of Quartz at work. I’ll explain everything as we go along. Open up the demo app from last time, and let’s get started! First, we have to add the CoreGraphics and QuartzCore frameworks to our project. These frameworks will support the Quartz code we’ll be writing. We use loadView here in place of a xib file, because (in my opinion) two lines of code, which is all we will need here, is simpler than a whole file to manage. Make sure you import CustomView.h. If you run the app now and browse through the graphics demos table, you’ll see our custom view with the gray background. We’re going to use one custom view to handle all our drawing needs. We will tell the view what type of content to draw, and then we can use Quartz subroutines (a fancy word for methods/functions) to draw the actual content. We’ll set up an enumerated type for the different demos we’ll work with. In addition, there is a preferred way to work with Quartz subroutines; we’ll discuss this as well. Synthesize the property. 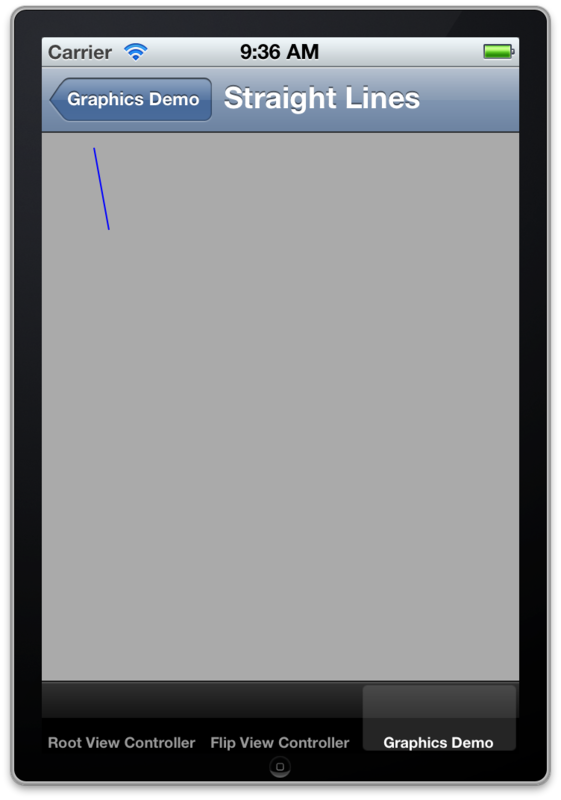 Also add the same property to CustomDrawingViewController and synthesize it. Knowing that we have three rows in a section, we simply take the indexPath and use it to calculate an integer value that corresponds to our enumerated type (remember than enumerated types are basically specific names given to integer values) and pass it along. For each subroutine, we have to push and pop a graphics context. Quartz is a state-based drawing system. If we didn’t push on a graphics context, and we made a state change, such as changing the stroke or fill color, you don’t want to be caught off-guard when you return to the calling method. This could be a bigger issue if the subroutine you’re using was written by someone else; it would be nearly impossible (and very impractical) to restore the state to the way it was before the method call without pushing and popping a graphic context. Where "context" is an argument passed into the subroutine. Now let’s fill in those methods. Drawing lines, or paths, as they are called in Quartz, begins with defining a path, moving and adding lines to points, and finishing the path. Then you can stroke and/or fill it to make it visible. Note that simply drawing and closing a path will make it exist in memory, but it will not actually be drawn on screen until you request a stroke or fill. We’ll start by drawing some lines and playing around with the settings. 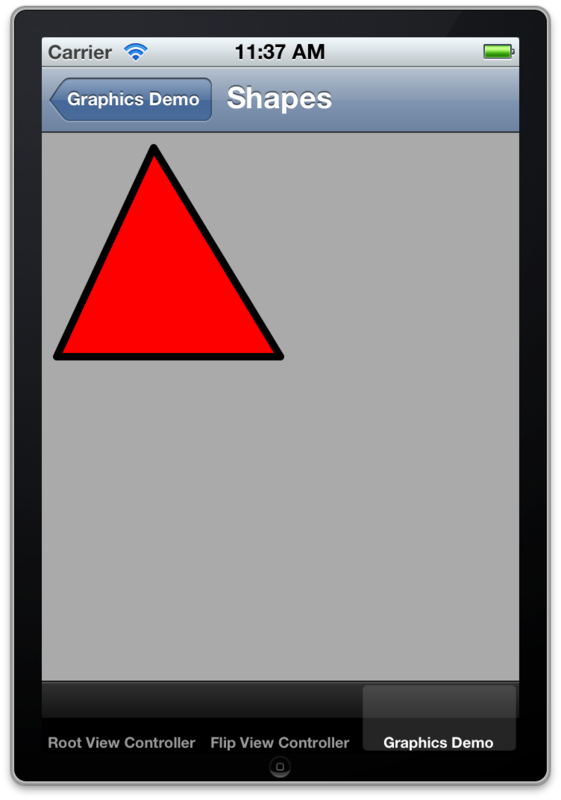 If you build and run and navigate to the corresponding view, you’ll see a thin blue line in the top-left of the screen. Add this line right after the UIColor call. Build and run, and you’ll see that the line is now much thicker. > Quartz draws a circle with a diameter > equal to the line width around the > point where the two segments meet, > producing a rounded corner. The > enclosed area is filled in. The idea here is that to draw lines in Quartz, you begin by defining the path and its endpoints. Then you specify the stroke color and other stroke settings, then actually stroke it. So try drawing another line—make it red, and stretch diagonally down and to the left from the upper-right corner. > Quartz extends the stroke beyond the > endpoint of the path for a distance > equal to half the line width. The > extension is squared off. The function to set the dash is CGContextSetLineDash(). This takes four parameters. The first is the context. The second is an amount of offset—you can start a few pixels into the pattern which you specify in the third argument, which is a C-style array of floats. The fourth argument is the number of elements in that array. One final point here: we’ve made a lot of changes to the graphics context, setting stroke colors, line caps, and dash patterns. If we didn’t push and pop the context, these changes would be used for the rest of the drawing in drawRect:, which is almost never what we want. It’s important to push and pop because it restores the calling context. 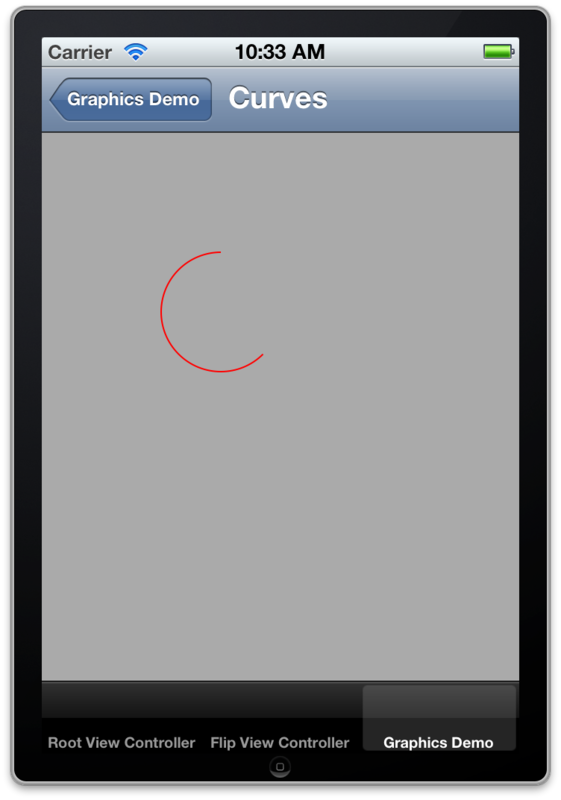 Build and run, and you should see a portion of a circle in red on the screen. Quartz will then draw a straight line from the end of your line to the start of the arc. You define an arc by calling the function CGContextAddArc(). The first argument is the context. The next two are x- and y- coordinates for the center of the arc—the center point of the circle from which the arc is drawn. The fourth argument is the radius of the circle. The next two are the start angle and end angle, measured in radians where zero is horizontally to the right—the “positive x-axis”. The last argument is either a 0 or 1, where 0 is counterclockwise and 1 is clockwise. > The placement of the two control > points determines the geometry of the > curve. If the control points are both > above the starting and ending points, > the curve arches upward. If the > control points are both below the > starting and ending points, the curve > arches downward. If the second control > point is closer to the current point > (starting point) than the first > control point, the curve crosses over > itself, creating a loop. The curve that results is always tangental to the path that can be drawn between the starting and ending points, tracing through all the control points in order. The first two examples draw a quadratic Bézier curve with one control point. The function of interest is CGContextAddQuadCurveToPoint(). The first argument is the context, followed by the x- and y- coordinates of the control points and the x- and y- coordinates of the end point. Moving the control point can dramatically change the shape of the curve. The third example is a cubic Bézier curve with two control points. CGContextAddCurveToPoint() takes the context, the x- and y- coordinates of the first control point, the x- and y- coordinates of the second control point, and the x- and y- coordinates of the end point. The control points pull the curve along; I’ve illustrated the control path formed by the control points in a dashed gray line. Of course, all the things you can do with regular paths apply to curves as well; in fact, think of curves as a path component that you can easily append to existing paths. You can chain multiple paths together just by beginning a path, adding lines and curves, and stroking it. Now let’s talk about closing paths. Quartz includes some convenient ways to draw rectangles, ellipses, and circles. Quartz provides CGContextAddRect() to draw a CGRect struct. This is an easier way to draw a rectangle than manually calculating and adding lines to points. Quartz also provides CGContextAddEllipseInRect() which draws an ellipse in the rectangle, using filling the width and height of the rectangle; the rectangle itself does not get drawn. To draw a circle, pass in a rect that has the same width and height—a square. In the next section, we’ll look at the next section of Quartz graphics.